The GLO-TOOB FX - has all the features of the original unit, except the FX has Glo-Toob's new multi-mode technology built in. What does that mean? Well, the user can select 1 of 7 different operational modes! In addition to this, the user can select a locked or preferred mode - this is the mode the unit will activate when it is switched on. 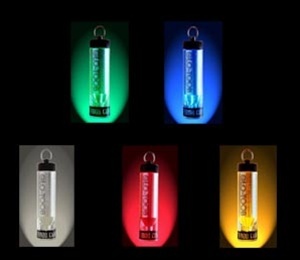 Much the same as the original GLO-TOOB, the GLO-TOOB FX is available in 5 colors - red, amber, blue, green and white. It is powered by the same inexpensive alkaline battery - although battery life is extended with some of the new modes. It also has the same durability and waterproof properties - all of which will ensure a lifetime of use. For a complete list of features and functions, please select the TECHNICAL SPECS tab above. Extremely bright. Visible for miles.